The differences in personalities and how they shade our perceptions can affect the way healthcare professionals communicate and interact with patients, colleagues, and other individuals in their workplace. Discovering and understanding your own strengths and idiosyncrasies while adapting to others can be an overwhelming task. In response to this common frustration, What Color Is Your Brain? When Caring for Patients: An Easy Approach for Understanding Your Personality Type and Your Patient’s Perspective explains the distinctive similarities and differences that impact your daily thoughts and actions. Sheila Glazov, joined by nurse Denise Knoblauch, created colorful personality profiles that simplify the complex nature of the healthcare professionals’ attributes and abilities in the workplace while interacting with their patients. What Color Is Your Brain? When Caring for Patients is intended to facilitate effective communication and cooperation and minimize stress and frustration in numerous aspects of your work day. Take the Healthcare Professional “No Right or Wrong Answer” Brain Quiz to effectively analyze your unique characteristics to determine your Brain Colors and to recognize your unique traits and talents in your workplace. Then, read and enjoy the relevant and motivating anecdotal stories from 25 healthcare professionals, which are strategically placed throughout the book. Rather than offer an excuse for people’s behavior, this book helps to explain why your perspective differs from or relates to the viewpoints of others. Engaging, educational, and easy to read, What Color Is Your Brain? When Caring for Patients is a guide to discovering and decoding who you are, why others see you the way they do, and how the four Brain Colors play a role in your career and workplace. What Color Is Your Brain? When Caring for Patients: An Easy Approach for Understanding Your Personality Type and Your Patient’s Perspective explores the essential pieces of the puzzle that is human interaction. 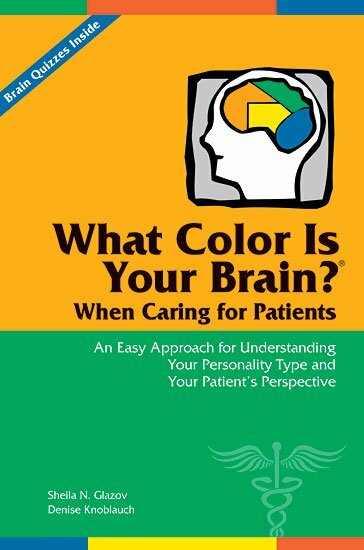 With the help of this dynamic book, determining your own Brain Colors and learning to improve your communication and collaboration with patients, colleagues, administrators, and others is bound to be a no-brainer. This book will help you put the Patient First and enable you to provide excellent patient care! Every healthcare professional should read this book in order to improve patient satisfaction, relationships with their health care team, and improve communication! The charts are a quick reference you can use daily. Understanding an individual’s personality traits is paramount in being able to effectively manage any communication cycle. WCIYB? is a great system and easy to learn. As a clinician, it makes me better equipped to understand my patients and shape my communications in a way they can truly “listen”, understand, and accept. I love all the health care examples and tables for quick and easy access to the Brain Colors. When our patients are not feeling well and are facing medical obstacles, I have a great resource to be able to connect and provide the most therapeutic support possible and create a healing environment. Thank you for all your Brain Color Magic! This book is a “Must Read!” I was re-energized, while reading Sheila Glazov’s and Denise Knoblauch’s book, which gives you easy to understand tools and methods that you can use immediately. I will be much more effective improving our employee safety culture and managing change by being better equipped to recognize, accept, appreciate, and adjust my approach to the different Brain Color attributes that everyone brings to the table. Sheila Glazov has dedicated years of study to a better understanding of relationships between people. Her creativity and enthusiasm for this topic is clearly demonstrated in the unique concepts presented in this book. The importance of building rapport with patients in order to gain their trust and confidence is a critical tool in developing good communication, improved clinical outcomes and patient satisfaction. Sheila Glazov skillfully captures the essence of personality types in this easy to read, indispensable gem. See yourself in the unforgettable and relatable stories. Use it to gain a deeper understanding of yourself, which will give you the tools you need to connect with and appreciate your patients on so many levels. This inclusive and encouraging book has made neuroanatomy concepts accessible with clear explanations of the different Brain Colors and how they relate to health professionals and patients. The examples and stories make the information personal, interesting, fun, and uplifting. The organization of the chapters makes it all flow together, reminding us of all the Brain Color attributes and how to apply them. I urge everyone who works in the healing professions to read this indispensable book! Sheila and Denise present a holistic approach that, as a therapist, has inspired and helped me understand that each of my clients requires a colorful, unique method to achieve wellbeing. As a manager, it has expanded my awareness of the rare gifts that each staff member possesses. This book is a must read for all healthcare professionals! It cuts through the minutiae about understanding your patients’ perspective, like a surgeon's scalpel! The relationship with patients and co-workers and the no-brainier conflict resolution chapters will be an immense help to me and my office staff. Currently, the best approach to the patient is patient centered medicine. Knowing the patient’s personality allows an understanding of his or her perspective. This color-filled book allows you to open the patient's heart and compassionately treat the patient as a Person. Great approach! Immediately, I was interested in learning the color of my brain and my patients’ and co- worker’s brains. "I originally purchased this book to supplement lectures I was giving to my graduate OT students, hoping to find a straightforward way to explain building therapeutic rapport with our patients. However I quickly found myself applying these color concepts not only in my classroom, but in my own clinical practice as well. I was amazed at how intuitive the information feels, and how it really can help us to mediate what appear to be personality conflicts, but instead are just different colors of the rainbow in action. A must read for allied health students and professionals alike – next year it will be the required textbook for my course!" Sheila N. Glazov is an award-winning author, internationally known personality expert, passionate educator, and professional speaker. Sheila’s programs and books help individuals decrease the conflict and increase the harmony, collaboration, and effective communications in their homes, workplaces, schools, and communities. Her innovative style has won Sheila praise for her What Color Is Your Brain?® (WCIYB?) Programs in conference rooms and classrooms in the United States and around the world. Encouraging adults and children to recognize and respect the best in themselves and others is the essence of her programs and books. Sheila’s programs offer practical and applicable concepts from her popular What Color Is Your Brain?® books. During a WCIYB? Program, individuals learn to utilize their own “Instant Personality Decoder” to recognize and value their personal perspective and to accept others’ viewpoints, improve their job performances, communicate more effectively, resolve conflicts quickly, build healthier relationships, and create harmonious relationships in their professional and personal lives. Adults and children discover their Brain Colors and learn communication skills that go beyond their workplaces and schools, similar to multiplication tables—people never forget! 1. What Color Is Your Brain?® A Fun and Fascinating Approach to Understanding Yourself and Others is the original quick and easy personality profile that helps adults and children quickly understand the differences in their personalities. What Color Is Your Brain?® has been translated into Portuguese and traditional Chinese. 2. Princess Shayna’s Invisible Visible Gift is an exquisitely illustrated and engaging children’s chapter book adaptation of Sheila’s book, What Color Is Your Brain?® Princess Shayna’s Invisible Visible Gift has been adapted into two musical productions. 3. The Teacher’s Activity Guide for “Princess Shayna’s Invisible Visible Gift” is a teacher’s resource to apply Princess Shayna’s valuable lessons in the classroom. 4. Purr-fect Pals: A Kid, A Cat & Diabetes is a picture/activity/resource book designed to offer comfort, education, and encouragement to children and their families who live with the challenges of Type 1 diabetes (T1D) and Type 2 diabetes (T2D). Sheila allocates 100% of the royalties from the sale of Purr-fect Pals: A Kid, A Cat & Diabetes to the Juvenile Diabetes Research Foundation (JDRF). Sheila allocates 10% of the royalties from the sale of all of her other books to the Juvenile JDRF. Sheila is honored to be a member of the Board of Chancellors, South Jersey Chapter of JDRF. Sheila has first-hand knowledge and experience with the numerous challenges that living with diabetes creates. Sheila’s elder son was diagnosed with T1D in 1985, when he was fifteen years old, and her father (of blessed memory) had T2D. Sheila earned her Bachelor of Science degree in education from the Ohio State University. Sheila has a degree in Creative Leadership from Disney University and is a graduate of the Creative Problem Solving Institute and the McNellis Creative Planning Institute. She has taught 3rd grade and high school English as a Second Language. Sheila has been an adjunct faculty member of William Rainey Harper College and a guest instructor at DePaul, Penn State, and Northwood Universities. Sheila has been a member of the Professional Speakers of Illinois, the National Speakers Association, the National Speakers Association of Illinois, the Society of Children’s Book Writers and Illustrators, the Midwest Writers Association, the National Association for Self-Esteem, the Governors’ Commission on the Status of Women in Illinois, Women In Management, Women in Networking, the Women’s Task Force for Congresswoman Melissa Bean, and a board member of many community organizations. For more information about Sheila’s What Color Is Your Brain?® Professional Development Programs and School Programs and her books, please visit http://www.SheilaGlazov.com. Denise Knoblauch, BSN, RN, COHN-S/CM, is a nationally known health care expert on occupational health nursing. She has spent the past 24 years caring for health care workers. Her patients are hospital employees. Denise has been employed in the health care field for more than 33 years. She earned an Associate’s Degree in nursing from Illinois Valley Community College, Oglesby, Illinois, and received her Bachelor of Science in Nursing from Bradley University. Peoria, Illinois. She has a certificate as a Six Sigma green belt. She is a Certified Occupational Health Nurse Specialist/Case Manager by the American Board of Occupational Health Nurses (ABOHN), a certified hearing conservationist, and a guest lecturer at Illinois State University. Denise met Sheila Glazov at a WCIYB? workshop for occupational health nurses in 2007, and they have been speaking fluent Brain Color since that time. Denise engaged Sheila as a keynote speaker for the national Association of Occupational Health Professionals in Healthcare (AOHP) when Denise was the national conference chair. Denise uses and shares the Brain Color approach and terminology in her personal and professional life on a daily basis, which aids her in adapting communication and accepting of others. Denise has spent the past 24 years striving to make the workplace safer for health care workers. She has been an active member in all her professional nursing associations. She co-founded her local AOHP chapter to develop a local networking opportunity for other occupational/employee health nurses. She quickly became a leader at the AOHP chapter level, serving as Vice President, which led to opportunities to serve as a leader at the national level, and she spent 16 years serving as AOHP Executive Secretary, Vice President, President, and President Emeritus. Denise currently serves as the AOHP Continuing Education Co-Chair and the Getting Started on the Road Co-Chair at the national level. She is also leading a team to develop Beyond Getting Starting education for the AOHP members. Denise has served as The Joint Commission liaison representative for AOHP and was the inaugural AOHP representative on The Joint Commission Nursing Advisory Council. Denise has mentored numerous occupational health professionals who were new to the field of nursing. She currently serves on the ABOHN and is the Case Manager Chairwoman. Denise has also given professional presentations at the AOHP and the American Association of Occupational Health Nurses (AAOHN) national conferences, AOHP state meetings, and AAOHN regional meetings and presented national webinars for ABOHN regarding obtaining certification as an occupational health nurse. Denise has participated in the National Institute for Occupational Safety and Health (NIOSH) Public Meeting for the proposed NIOSH Health and Safety Practices Survey of Healthcare Workers. She also served as the occupational health nursing representative for the NIOSH industrial hygiene occupational health committee. Denise has served on the Department of Homeland Security Infection Prevention and Control Target Capabilities Committee. She had been instrumental in developing the case manager positions at her previous employer. She also was selected as one of inaugural lead green belts in the ambulatory care division, assisting departments in improving health outcomes and functioned as a team leader for projects at OSF Saint Francis Medical Center, Peoria, Illinois. For 18 years, Denise functioned in a variety of nursing roles in the Occupational Health Department, OSF Saint Francis Medical Center, Peoria, Illinois. Prior to her employment at OSF Saint Francis Medical Center, Denise was employed at St. Mary’s Hospital, Streator, Illinois, for 14 years, working in pediatrics, general medical, home health, employee health, and infection control and prevention nursing roles. She worked as a telephonic case manager for Erie Insurance Group. Denise admits to being a Green Brainer and is amazed that she took a job in which she spends her day on the phone!